Tip $50 and get This reward will get your name on the credits of my next video! Sarah: That would be wonderful! I will get in touch soon offline. linsheffield: Rock, Sarah - this is so strange and wonderful. We love the music and the musicians - and it brings us together after such a long time. Love y'all! rockland-moran: Tones guit is making a noise--- too hot?? linsheffield: Hi Cheri - This is a great connection! Unchained melody yes! linsheffield: OMG we're having a great time! Cheri: My absolutely favourite song ... can't wait to hear Kristi sing it!! linsheffield: Cheri - it's such a sad song for me - buckets of tears, but I still love it! Cheri: Oh ... no tears! linsheffield: Yeah, you're right. What a great way to "talk", eh? I'm pretty sure it means something to biz = we'll figure it out. What a lovely way to connect! linsheffield: It's totally amazing to interact with you and with your audience ... really, truly ... I feel this is the future. I don't understand how communicating via computer can seem so personal ... all I can say is, it's working! linsheffield: are streaming audio through Bluetooth. Cheri: I am also now hearing some crackling. linsheffield: Hi Kimberley - I'm not sure if you're the Kim that I remember, but either way, nice to meet you. linsheffield: Oh Kim! Yes, it's MOM! Love you and love your photos! linsheffield: I feel truly blessed to know the world's best people! linsheffield: Sarah - if you're firm is looking for truly unique and outstanding photography, Kiim's your lady, without a doubt. rockland-moran bought reward: "A download of either Any Given Night or The Whiplash Curve"
Kimberley bought reward: "An mp3 of any of my songs. You get to choose which one!" Kimberley: Ps your hair !!!!! linsheffield: Thanks, Kristi and Tony. It's been a great experience. Gotta tell ya - "unchained melody rips my heart out, but I truly loved this experience! Love You! linsheffield: So nice that you have hair! What was your favorite part of the performance? Obviously the music was the major focus and hugely successful part of the evening - but the interaction with the viewers was wonderful also! My request - Unchained Melody - was the icing on the cake for me!! VERY enjoyable evening - thank you!! An mp3 of any of my songs. You get to choose which one! A handwritten postcard from beautiful Victoria, British Columbia! A handwritten lyric sheet to any song of your choosing! This reward will get your name on the credits of my next video! 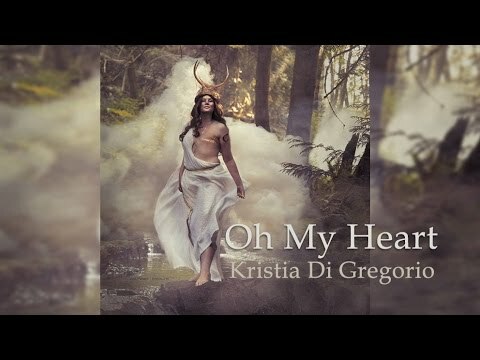 Acoustic indie folk chanteuse and songwriter Kristia Di Gregorio sets free soul-filled songs that amble through the twists of her winding life’s path and inspire others to embrace their best selves. An imaginative and enthusiastic storyteller, the elegant strength of her voice sparkles through enlightened lyrics that illuminate the dramatic complexity of human emotion and tell tales of love, heartbreak, joy, loss and triumph. Her bold recordings feature delicate layers of melody and harmony bolstered by strings, guitar and percussion – tunes tinged with elements of jazz and blues that dance with modern pop and folk. Kristia spills out deep secrets during her intimate, entertaining performances, inviting others into her playful inner world, brimming with magic, grace and honesty.